This national depiction of storm surge flooding vulnerability helps people living in hurricane-prone coastal areas along the U.S. East and Gulf Coasts, Puerto Rico, U.S. Virgin Islands (USVI), Hawaii, and Hispaniola to evaluate their risk to the storm surge hazard. These maps make it clear that storm surge is not just a beachfront problem, with the risk of storm surge extending many miles inland from the immediate coastline in some areas. If you discover via these maps that you live in an area vulnerable to storm surge, find out today if you live in a hurricane storm surge evacuation zone as prescribed by your local emergency management agency. If you do live in such an evacuation zone, decide today where you will go and how you will get there, if and when you're instructed by your emergency manager to evacuate. If you don't live in one of those evacuation zones, then perhaps you can identify someone you care about who does live in an evacuation zone, and you could plan in advance to be their inland evacuation destination – if you live in a structure that is safe from the wind and outside of flood-prone areas. The National Oceanic and Atmospheric Administration (NOAA), specifically the National Weather Service's (NWS) National Hurricane Center (NHC), utilizes the hydrodynamic Sea, Lake, and Overland Surges from Hurricanes (SLOSH) model to simulate storm surge from tropical cyclones. Storm surge information is provided to federal, state, and local partners to assist in a range of planning processes, risk assessment studies, and operational decision-making. In regards to the former, tens of thousands of climatology-based hypothetical tropical cyclones are simulated in each SLOSH basin (or grid), and the potential storm surges are calculated. Storm surge composites – Maximum Envelopes of Water (MEOWs) and Maximum of MEOWs (MOMs) – are created to assess and visualize storm surge risk under varying conditions. While MEOWs and MOMs provide a local assessment of storm surge risk, they do not provide a seamless perspective of the hazard owing to the many discrete SLOSH grids. This section briefly describes the scientific techniques used to create the seamless inundation maps for Category 1-5 hurricanes using the SLOSH MOM product as well as a description of the datasets and map viewer available to the public. SLOSH has been used operationally for more than three decades. Over this time, SLOSH has provided valuable and accurate storm surge forecasts. For planning purposes, the NHC uses a representative sample of hypothetical storms to estimate the near worst–case scenario of flooding for each hurricane category. These SLOSH simulations are used to create a set of operational and planning products. The NHC provides two products based on hypothetical hurricanes: MEOWs and MOMs. MEOWs are created by computing the maximum storm surge resulting from up to 100,000 hypothetical storms simulated through each SLOSH grid of varying forward speed, radius of maximum wind, intensity (Categories 1-5), landfall location, tide level, and storm direction. A MEOW product is created for each combination of category, forward speed, storm direction, and tide level. SLOSH products exclude Category 5 storms north of the NC/VA border and for Hawaii. For each storm combination, parallel storms make landfall in 5 to 10 mile increments along the coast within the SLOSH grid, and the maximum storm surge footprint from each simulation is composited, retaining the maximum height of storm surge in a given basin grid cell. These are called MEOWs and no single hurricane will produce the regional flooding depicted in the MEOWs. SLOSH model MOMs are an ensemble product of maximum storm surge heights. SLOSH MOMs are created for each storm category by retaining the maximum storm surge value in each grid cell for all the MEOWs, regardless of the forward speed, storm trajectory, or landfall location. SLOSH MOMs are available for mean tide and high tide scenarios and represent the near worst-case scenario of flooding under ideal storm conditions. A high tide initial water level was used for the storm surge hazard maps. SLOSH employs curvilinear polar, elliptical, and hyperbolic telescoping mesh grids to simulate the storm surge hazard. The spatial coverage for each SLOSH grid ranges from an area the size of a few counties to a few states. The resolution of individual grid cells within each basin ranges from tens to hundreds of meters to a kilometer or more. Sub–grid scale water features and topographic obstructions such as channels, rivers, and cuts and levees, barriers, and roads, respectively are parameterized to improve the modeled water levels. Figure 1 shows the SLOSH basins used to create the surge hazard maps. Figure 1. The SLOSH basins used to create the storm surge hazard maps. SLOSH grids are not drawn to scale. In locations that have a steep and narrow continental shelf, wave setup can be a substantial contributor to the total water level rise observed during a tropical cyclone. Wave setup is defined as the increase in mean water level due to momentum transfer to the water column by waves that are breaking or otherwise dissipating their energy. Through NOAA's Integrated Ocean Observing System (IOOS) Coastal and Ocean Modeling Testbed (COMT) the SLOSH model has been loosely coupled to the Simulating Waves Nearshore (SWAN) third-generation wave model, developed at Delft University of Technology (http://www.swan.tudelft.nl/), for storm surge modeling applications in island regions such as Puerto Rico, USVI, and Hawaii. In these locations, SLOSH+SWAN simulations were conducted to create MEOW and MOM products that account for the increase in the mean water level due to wave setup. Through the USAID/WMO Coastal Inundation and Flooding Demonstration Project for the Island of Hispaniola, the SLOSH model has been coupled with an efficient parametric wind wave model courtesy of NOAA/NCEP/EMC. In this location, SLOSH+Wave simulations were conducted to create MEOW and MOM products that account for the increase in the mean water level due to wave setup. Data has been processed by the National Hurricane Center (NHC) Storm Surge Unit. U.S. Geological Survey (USGS) 3D Elevation Program (3DEP) dataset (http://nationalmap.gov/3DEP/index.html). To create this map for the US Gulf and East Coasts, the 3DEP and OCM DEMs were resampled to 1 arc-second (about 30 m) using a bilinear interpolation and mosaicked together to produce a seamless raster elevation dataset. The combined DEM was smoothed via a neighborhood circle approach with a radius of two grid cells using the focal statistics tool in Esri ArcGIS Platform. This minor level of smoothing provides a less noisy map that is easier to interpret, and ultimately a seamless DEM for storm surge inundation mapping. The NOAA OCM high-resolution DEMs were used for Puerto Rico, USVI, and Hawaii. The native grid cell size for that data is about 3m and for the purposes of this analysis, that data was resampled to a grid cell size of about 9 meters. In areas outside of the U.S., such as Hispaniola, the analysis uses TanDEM-X (TDX) DEM data provided by German Aerospace Center (DLR). Resolution of TDX DEM is 0.4 arc seconds in latitudinal direction and varies in longitudinal direction between 0.4 arc seconds (equator) and 4 arc seconds (85 degrees N/S) (Wessel, 2016). In partnership with the Department of Earth and Environment/International Hurricane Research Center at the Florida International University, the raw data was filtered to remove non-ground features. The process to create storm surge inundation maps from the existing SLOSH MOM products requires several technical steps. First, the usable areas of the SLOSH grids were reduced to ignore spurious data along the grid boundaries. The SLOSH basins have considerable overlap to allow for complete storm surge coverage for planning and operations. Merging these basins into a seamless product requires specialized technical considerations. Since the grid boundaries yield unreliable data, basin overlap was minimized, and the high-resolution and center portions of grids were retained. The process used herein leveraged both SLOSH basin building and surge modeling expertise at NHC. Second, the maximum water levels in each MOM were merged onto a uniform grid for processing. The data were merged onto the NWS National Digital Forecast Database (NDFD) Lambert Conformal projected grid with a horizontal resolution of roughly 625 m (the actual resolution varies by latitude). Lastly, the merged MOM grids were processed through Esri ArcGIS to subtract the land elevation and create a seamless raster of inundation. It should be noted that the SLOSH MOM storm surge hazard data used to create these maps are constrained by the extent of the SLOSH grids. High-quality maps are essential for effective risk communication. This page outlines the approach to merging the SLOSH MOM products to create a seamless view of storm surge inundation and risk for Category 1-5 hurricanes. Using social science research, the carefully derived and high resolution inundation maps provide a means for effective risk communication and analysis. The maps show that all coastal states from Texas to Maine, as well as the island of Puerto Rico, USVI, Hawaii, and Hispaniola are vulnerable to storm surge inundation, and the risk significantly increases with increasing hurricane category. Locations along the Gulf of Mexico are extremely vulnerable to storm surge, in terms of both height and inland extent due to a wide and flat continental shelf over the majority of the region and low-lying land elevations extending well inland. Puerto Rico, USVI, Hawaii, and Hispaniola are also vulnerable to storm surge and wave impacts. Large bays, tidal rivers, etc. are extremely vulnerable to storm surge flooding. These data and this approach taken to inform the public of storm surge risk are valuable to federal, state, and local NOAA partners, academic, private, and other various organizations. Knowing the total population affected by storm surge inundation is important for overall awareness and public safety. The population data are based on the 2010 census block demographic information. In a worst-case scenario, approximately 24 million people along the East and Gulf coasts are at risk from storm surge flooding. Figure 2. 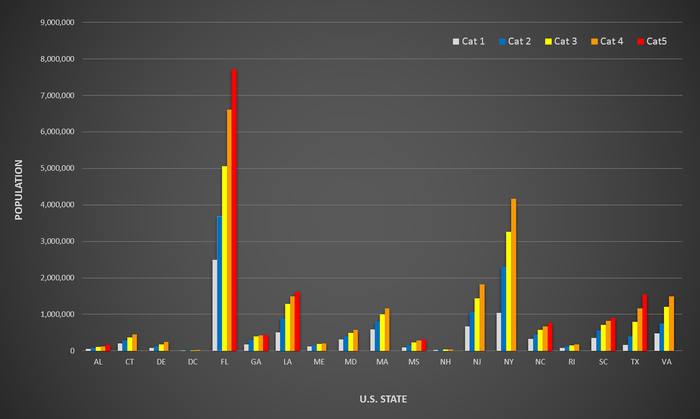 The population at risk from storm surge in each U.S. State for different hurricane intensities. Storm surge hazard maps are available for Texas to Maine, Puerto Rico, USVI, Hawaii, and Hispaniola. The data are available in GeoTIFF (http://trac.osgeo.org/geotiff/) format for use in Geographic Information Systems (GIS) software. Comprehensive metadata are provided with each GIS file describing the data and its limitations. Storm surge inundation datasets are created using the high tide scenario SLOSH MOM products for all regions. Each dataset contains an ESRI World File (.tfw) and metadata .xml file. These GeoTIFFs are 8-bit unsigned integer raster datasets that correspond to 1 ft inundation bins (e.g., Class Value 1 corresponds to the 0-1 ft inundation bin, Class Value 2 corresponds to the 1-2 ft inundation bin, and so on). The maximum Class Value is 21, and inundation in excess of 20 ft is assigned a Class Value of 21. A Class Value of 99 is assigned to leveed areas. A more detailed description of the data can be found in the associated metadata. The storm surge hazard maps and GIS data (if a new version is available) will be updated as new SLOSH grids and DEM data are processed. The data and maps in this tool illustrate the height of possible storm surge flooding under certain scenarios, and do not account for erosion, subsidence, sea-level change or future construction. Water levels are based on storm surge scenarios in the referenced SLOSH MOM tide scneario. The data, maps, and information provided should only be used as a tool for general education/awareness of the storm surge hazard at a city/community level (not for a parcel level/grid cell assessment). The SLOSH MOM storm surge hazard data used to create these maps are constrained by the extent of the SLOSH grids and users should be aware that risk due to storm surge flooding could extend beyond the areas depicted in these maps. This map should not be used to replace the maps used for hurricane evacuation zones. Hurricane evacuation zones are drawn at a local and state level and consider additional information and specific criteria for a particular region in addition to the storm surge hazard. Users are urged to consult local officials for flood risk inside the hatched areas marked as leveed areas in the map. The data and maps in this tool are provided "as is", without warranty to their performance, merchantable state, or fitness for any particular purpose. The entire risk associated with the results and performance of these data is assumed by the user. This tool should be used strictly as a planning reference and storm surge risk awareness tool and not for navigation, permitting, legal, or regulatory purposes. Any conclusions drawn from the analysis of this information are not the responsibility of the National Weather Service, National Hurricane Center, Office for Coastal Management, or its partners.